Spanish rabbi; flourished in the first half of the fifteenth century at Maqueda and Guadalfajara, Castile. The name is the Arabic al-Rijal (Steinschneider, "Jew. Quart. Rev." xi. 610); according to H. Derenbourg ("Journal des Savants, November, 1898), it is derived from the Hebrew "ha-Ragil" (the expert). When in 1422 Don Luis de Guzman, grand master of the Order of Calatrava, was preparing in Toledo to make war upon the Moors, he seems to have suffered a change of heart; and, tired of the chase, of playing chess, and of reading romances of chivalry, he felt the need of a good translation of the Bible in Spanish, with a commentary thereon. He asked Rabbi Moses Arragel to undertake this work (April 5). At first the rabbi declined the invitation, feeling how impossible it was for a Jew to translate, or comment upon, the Bible in a manner to satisfy a Catholic. Don Luis, however, insisted; and he assigned Friar Arias de Enciena, custos of the Franciscans in Toledo, to make known to Moses his particular wishes in regard to the matter. The translation of the Old Testament in the Castilian language is one of several which were made at this time; and the cooperation of the Jewish rabbi with Catholic dignitaries in its production is one of the signs of the comparative religious tolerance then prevailing in Castile. It took Arragel many years to finish this work. When completed (June 2, 1430) it was presented by him with much ceremony to Don Luis in Toledo, in the presence of a concourse of prominent and learned men. The head of the Order of St. Francis, replying to the presentation address, expressed himself as follows: "Rest assured that if, please God, the interior of the Bible as regards its substance is equal to its exterior, it will be the most beautiful and the most famous work to be found in many a kingdom." 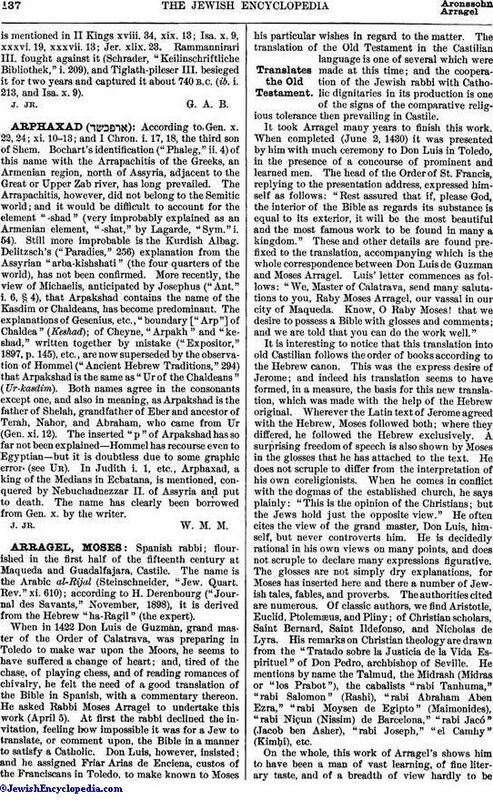 These and other details are found prefixed to the translation, accompanying which is the whole correspondence between Don Luis de Guzman and Moses Arragel. Luis' letter commences as follows: "We, Master of Calatrava, send many salutations to you, Raby Moses Arragel, our vassal in our city of Maqueda. Know, O Raby Moses! that we desire to possess a Bible with glosses and comments; and we are told that you can do the work well." It is interesting to notice that this translation into old Castilian follows the order of books according to the Hebrew canon. This was the express desire of Jerome; and indeed his translation seems to have formed, in a measure, the basis for this new translation, which was made with the help of the Hebrew original. Wherever the Latin text of Jerome agreed with the Hebrew, Moses followed both; where they differed, he followed the Hebrew exclusively. A surprising freedom of speech is also shown by Moses in the glosses that he has attached to the text. He does not scruple to differ from the interpretation of his own coreligionists. When he comes in conflict with the dogmas of the established church, he says plainly: "This is the opinion of the Christians; but the Jews hold just the opposite view." He often cites the view of the grand master, Don Luis, himself, but never controverts him. He is decidedly rational in his own views on many points, and does not scruple to declare many expressions figurative. The glosses are not simply dry explanations, for Moses has inserted here and there a number of Jewish tales, fables, and proverbs. The authorities cited are numerous. Of classic authors, we find Aristotle, Euclid, Ptolemæus, and Pliny; of Christian scholars, Saint Bernard, Saint Ildefonso, and Nicholas de Lyra. His remarks on Christian theology are drawn from the "Tratado sobre la Justicia de la Vida Espirituel" of Don Pedro, archbishop of Seville. He mentions by name the Talmud, the Midrash (Midras or "los Prabot"), the cabalists "rabi Tanhuma," "rabi Salomon" (Rashi), "rabi Abraham Aben Ezra," "rabi Moysen de Egipto" (Maimonides), "rabi Niçun (Nissim) de Barcelona," "rabi Jacó" (Jacob ben Asher), "rabi Joseph," "el Camhy" (KimḦi), etc. 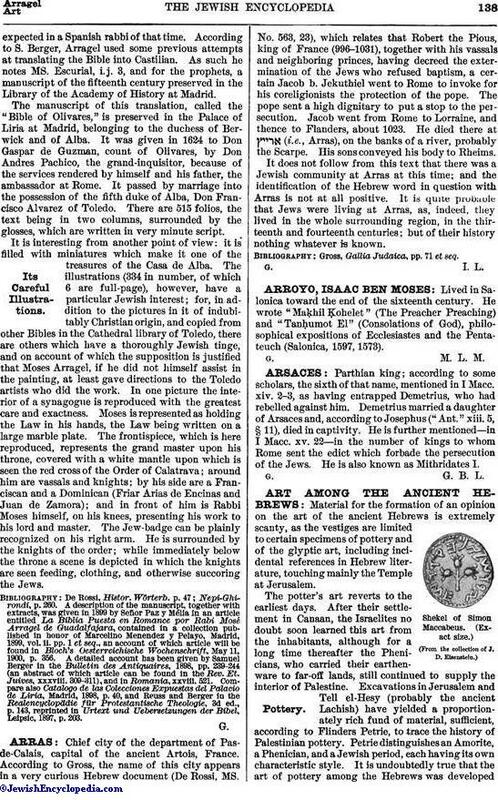 On the whole, this work of Arragel's shows him to have been a man of vast learning, of fine literary taste, and of a breadth of view hardly to beexpected in a Spanish rabbi of that time. According to S. Berger, Arragel used some previous attempts at translating the Bible into Castilian. As such he notes MS. Escurial, i.j. 3, and for the prophets, a manuscript of the fifteenth century preserved in the Library of the Academy of History at Madrid. The manuscript of this translation, called the "Bible of Olivares," is preserved in the Palace of Liria at Madrid, belonging to the duchess of Berwick and of Alba. It was given in 1624 to Don Gaspar de Guzman, count of Olivares, by Don Andres Pachico, the grand-inquisitor, because of the services rendered by himself and his father, the ambassador at Rome. It passed by marriage into the possession of the fifth duke of Alba, Don Francisco Alvarez of Toledo. There are 515 folios, the text being in two columns, surrounded by the glosses, which are written in very minute script. It is interesting from another point of view: it is filled with miniatures which make it one of the treasures of the Casa de Alba. The illustrations (334 in number, of which 6 are full-page), however, have a particular Jewish interest; for, in addition to the pictures in it of indubitably Christian origin, and copied from other Bibles in the Cathedral library of Toledo, there are others which have a thoroughly Jewish tinge, and on account of which the supposition is justified that Moses Arragel, if he did not himself assist in the painting, at least gave directions to the Toledo artists who did the work. In one picture the interior of a synagogue is reproduced with the greatest care and exactness. Moses is represented as holding the Law in his hands, the Law being written on a large marble plate. The frontispiece, which is here reproduced, represents the grand master upon his throne, covered with a white mantle upon which is seen the red cross of the Order of Calatrava; around him are vassals and knights; by his side are a Franciscan and a Dominican (Friar Arias de Encinas and Juan de Zamora); and in front of him is Rabbi Moses himself, on his knees, presenting his work to his lord and master. The Jew-badge can be plainly recognized on his right arm. He is surrounded by the knights of the order; while immediately below the throne a scene is depicted in which the knights are seen feeding, clothing, and otherwise succoring the Jews. Nepi-Ghirondi, p. 260. A description of the manuscript, together with extracts, was given in 1899 by Señor Paz y Mélia in an article entitled La Biblia Puesta en Romance por Rabi Mosé Arragel de Guadalfajara, contained in a collection published in honor of Marcelino Menendez y Pelayo, Madrid, 1899, vol. ii. pp. 1 et seq., an account of which article will be found in Bloch's Oesterreichische Wochenschrift, May 11, 1900, p. 356. A detailed account has been given by Samuel Berger in the Bulletin des Antiquaires, 1898, pp. 239-244 (an abstract of which article can be found in the Rev. Et. Juives, xxxviii. 309-311), and in Romania, xxviii. 521. Compare also Catalogo de las Colecciones Expuestas del Palacio de Liria, Madrid, 1898, p. 40, and Reuss and Berger in the Realencyclopädie, für Protestantische Theologie, 3d ed., p. 143, reprinted in Urtext und Uebersetzungen der Bibel, Leipsic, 1897, p. 203.